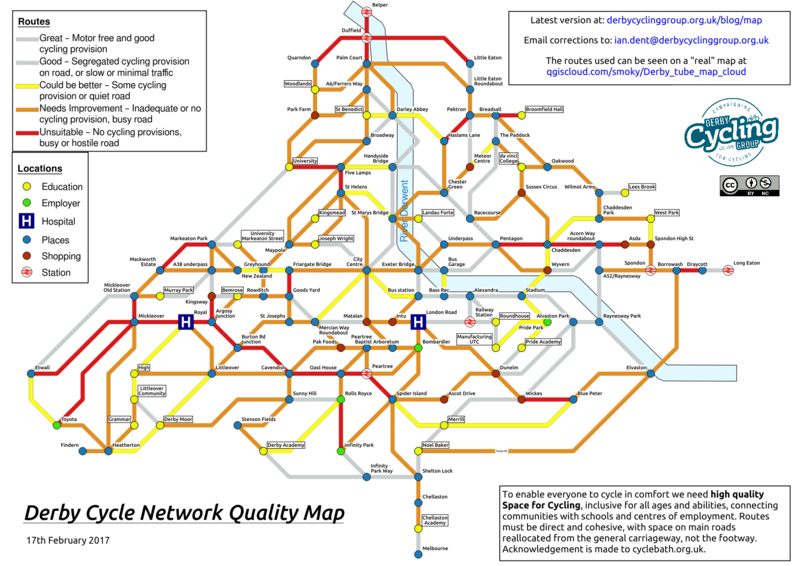 The Derby Cycle Network Quality map gives a rating of quality of the current cycle links in Derby. It shows locations that people need to cycle between and rates the links on a 5 point scale (red=bad, blue=good) based on the current cycling provisions. In the style of the London Tube Map, it shows schematically the links from one location to another. The latest version of the map can be found here and a (smaller file size) PNG version found here. A reasonably direct route has been taken between the points and rated (red to blue scale) as people would generally like to get from A to B by a reasonably fast route. In some cases, more roundabout but quieter routes are available but, if they are unreasonably long, have been discounted in the rating. A route is rated by its worst section. Often A to B can be excellent for 90% of the distance but horrendous for 10%. The horrendous part is what drives the rating. The map has been created from a “real” map which can be seen here and which allows people to see the roads/cyclepaths that would be taken between locations. 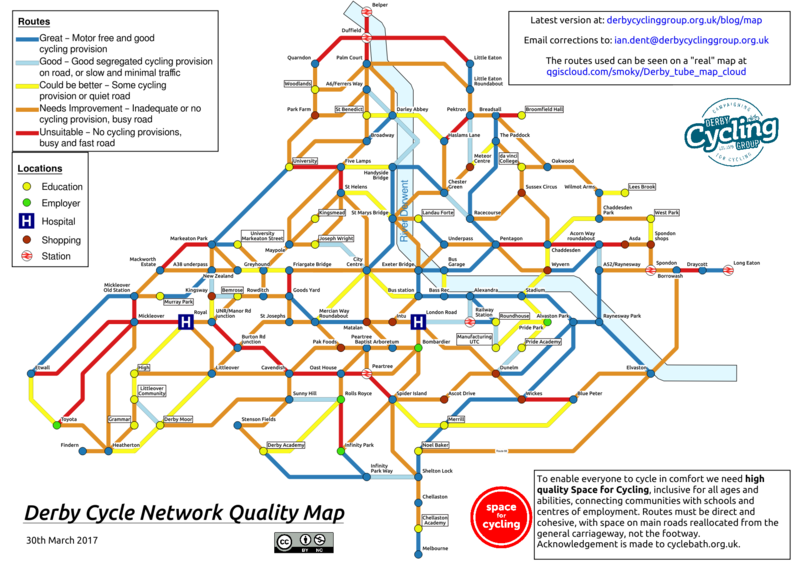 It’s important to note that the map is intended to be a “quality assessment” tool and not a navigation aid. 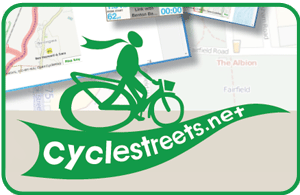 If you want to travel from A to B I’d suggest using Cyclestreets to get a route. The tube map will then give you an idea of the quality you can expect on the different parts of the journey. There are some good cycling routes in Derby but they are often not linked together to allow for safe and effective end to end journeys to be made. This can be seen more clearly on the version of the map showing just the good routes. It is clear that the Riverside path is a good facility but other good bits of route are often isolated. Various key destinations (e.g. Royal hospital) are completely disconnected from the good network. 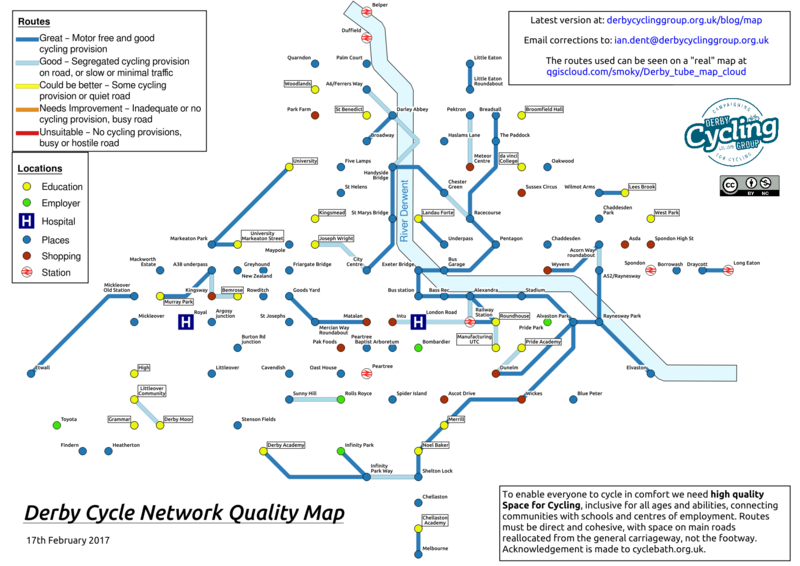 A version showing the routes needing improvement shows there is a lot of work still to do. We’re calling on all the political parties in Derby to support the development of a vision for the network. We’re aware that local government funding is tight but believe it is important that a plan for the desired network is in place so, as funding becomes available, effective routes can be built that fit into the overall plan. The development tools for the map are released for others to use freely so long as correct attribution is given and further use isn’t for commercial gain. Files for developing similar maps for other regions can be found here.